For now, let’s set aside that fact that there is no such thing as an “assault weapon.” It’s a made-up term for political purposes. It is not the same as an “assault rifle,” which actually has a real definition. So since “assault weapon” is a political term, the law must define it. Moylan’s legislation attempts to define an assault weapon, but fails miserably because, as I stated, politicians and gun-grabbers like Moylan don’t know the first thing about guns. (iii) a manufactured weight of 50 ounces or more when the pistol is unloaded. (iv) an ability to accept a detachable magazine of more than 5 rounds of ammunition. Let’s focus on (B), a the qualifications for a semi-automatic rifle to be an “assault weapon.” Basically, detachable magazine coupled with a telescoping stock and/or a barrel shroud. Sounds like your basic AR-15. Any firearm that uses rimfire ammunition. OK. Wait a minute! Aren’t these both “military style” weapons of war? Not based on Moylan’s bill. 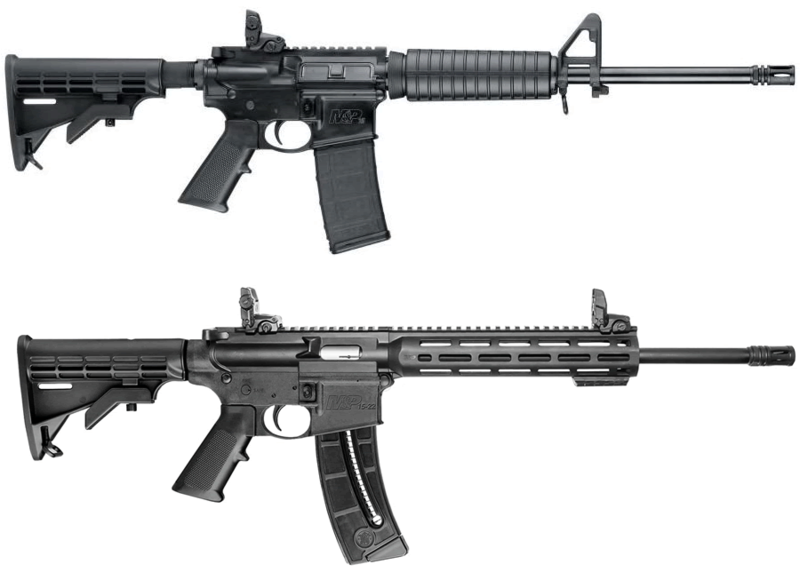 These are both Smith & Wesson M&P rifles. But the one on the top uses .223/5.56NATO ammunition (it’s an AR-15). The one on the bottom uses 22LR ammunition – a rimfire cartridge, which excludes it from Illinois’ potential assault weapon ban. So now that you know the difference between what is legal and what is not under this bill, let’s move on to an easier question. Which of the following two rifles would be banned? OH! That one’s easy, you say. Obviously, the firearm on the bottom is an assault weapon and would be banned. The one on the top would be legal. Possibly. This one is a little bit of a trick question. These are the same gun. Yes, these are both a Ruger Mini-14. As to whether it’s legal or not depends on how it is configured AT THE TIME. 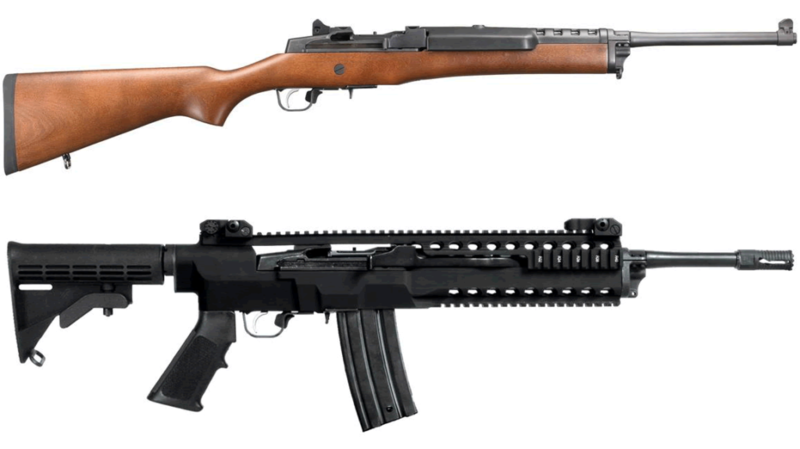 The one on the top is the popular “ranch rifle” configuration, while the bottom is tactical. What non-gun-types like Moylan don’t understand is that guns are modular. And what the Feds (the BATF that regulates this stuff) consider to be “the firearm” is what is known as the “lower receiver”. That’s the part that contains the information on the weapon, including the serial number. Everything else comes apart and is interchangeable – like a lethal Lego set. Of course, a person with criminal intent is probably not concerned with whether the configuration of his Mini-14 is legal or not when he is preparing for his crime. There are many more problems with this bill, aside from the fact that it’s a gross overreach of the 2nd Amendment to the Constitution. But the important point here is that these politicians don’t have any actual knowledge of the subject they are trying to legislate. Equally as ignorant are members of the media who pass it on to an uninformed public. The bill does absolutely nothing to make Illinois a safer place. Like so much of our approach to public safety in America, it is reactive rather than proactive. In terms of public safety, it does about as much as the no guns window stickers that declare buildings a gun free zone. They only stop the law abiding citizen. The criminal couldn’t care less about your sticker or your weapons ban.